Joe Mysak is a columnist for Bloomberg News. Formerly, he worked at The Bond Buyer as editor and publisher, as editor of American Banker, and also as editor of both Grant's Municipal Bond Observer and Grant's Municipal Bond Issuer. He wrote The Guidebook to Muncipal Bonds with George J. Marlin and edited The Bond Buyer's centennial edition. Chapter 2: Choosing Your Method of Sale. What your financial adviser can do for you. Chapter 4: How to Sell Bonds the Right Way. Paying the lowest interest cost. Chapter 5: The Role of the Underwriter. Chapter 6: How to Get into Trouble. You are responsible for your bonds. Chapter 7: The Bond Counsel. 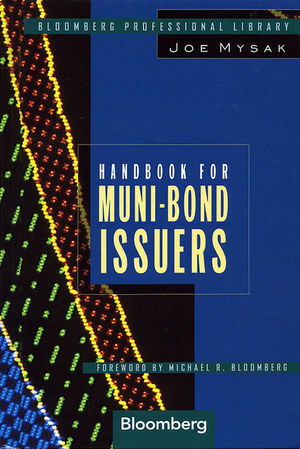 Chapter 8: Who Buys Your Bonds? A smaller group than you'd think. How to win bond elections. Chapter 10: What Happens in a Bond Sale. Chapter 12: After the Sale.